For DJ KRUSH it is very inspiring to work with artists across the world. Even the cultures and environments are all different. He is trying to make something global with guest artists, that goes way beyond borders. There are 11 tracks on the album with features of Yasmine Hamdan, Crosby "Cross" Bolani, Divine Styler, tha BOSS, Takashi Niigaki and Free the Robots. DJ KRUSH has performed in front of over 5 million audiences in 313 cities of 50 countries. And he still continues to renew this record, transcending all barriers, and leaving some distinctive footsteps of his own, achieving ever-increasing acclamation as an international artist. He is also considered as one of the pioneers of turntablism and after more than 25 years in the business you may confidently say: DJ KRUSH is a legend! Now breaking the silence, the much anticipated new album from DJ KRUSH is about to be released! He is back with his new album called "Butterfly Effect". DJ KRUSH sends out the realness to the world with his first album in almost 11 years. Deep sound resonates through dry and empty space! There are so many things happening on our planet, both act of God and all the disasters that human beings make. Very little difference in the initial condition affects everything and it becomes a big difference with time and it appears in front of us. Needless to say, it's not all about bad things. 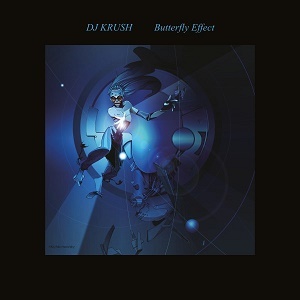 The future that DJ KRUSH and his guest artists visualize, as little things influence each other intricately... their Butterfly Effect is expressed in the new album.